E.l.f. is one of my favorite makeup brands. And not just for drugstore makeup. E.l.f. has such an amazing variety of really affordable, (almost always) high quality, cruelty-free products, that I am always excited to see what they’ve come out with! Most recently, it’s their line of Beautifully Precise makeup brushes, which are just stunning to look at. I only purchased one–by far the most unusual and intriguing brush I’ve ever seen–but it inspired me to show you what I’ve been collecting from E.l.f. over the past month. In this haul, I’m going to preview my new products (some are new to the line, some are just new to me) and then over the next few weeks, I’ll post a series of reviews on the products to update you on how they worked for me. So let’s jump in to the haul! The Multi-Blender Massager Brush ($12): I mean, how could I resist? Gorgeous shiny handle, innovative contoured shape, massager beads cut into the brush–I had to try it! The bristles are so incredibly soft, but still firm enough that I believe I’ll get a good makeup application. You can use this for foundation, powder, contour, bronzer–the package direct you to place product on different parts of the brush for different effects. I cannot wait to play with this. HD Undereye Setting Powder ($3): I was skeptical that this tiny pot of sheer powder would work to set my undereye area, but for $3 I thought I’d give it a try. My undereyes have been looking so dry and I wanted something brightening that wasn’t glittery. I’ve tried it a few times as so far so good! I just wonder how long it will last–it’s such a tiny amount! Matte Lip Color ($3): These have been around for awhile, but I’ve never tried them! I love the concept–the thinner lip crayon makes application and precision so easy. I’m really excited about the wine shade, but I’m not sure how the lighter colors will work on me. I’ve been trying more lighter or cool-tined nudes to practice balancing the rest of my face makeup with a lighter lip. I’ll let you know how it goes! Illuminating Palette ($6): I’ve heard this compared to the Hourglass Ambient Lighting Palette, in that the highlights are subtle and could be used on the cheekbones or even all over the face. The fluorescent lights in the classroom don’t do me any favors, and I think a subtle glow might work better in that setting. The shades are so pretty, and while they are soft, they are all distinct, which I like. The Daily Moisture Stick ($6) and the HD Mattifying Balm ($6): These are some odd products–you don’t see them in every makeup line. Since my skin is dry, I’m always looking for ways to moisturize throughout the day without adding shine.The Daily Moisture Stick looks like a clear glue stick and you just pat it on wherever your skin is feeling dry. Since I’m getting over a cold, I patted some around my nose, and it cools on contact and sinks right in with no shine. The Mattifying Balm is like a pressed primer that you pat on top of your skin to erase oil–you use it instead of a powder to avoid cakiness. I tried it briefly yesterday and it worked well, so I’ll see how it goes with continued use. Glitter Primer ($2): I bought this because my Too Faced Grand Hotel Cafe holiday set has some glitter shadows that have a lot of fallout. I wanted to see if a glitter primer helps, but I didn’t want to pay over $20 for Too Faced’s Glitter Glue. So let’s hope this $2 version works! And finally, because I bought so much stuff, I got a free gift. 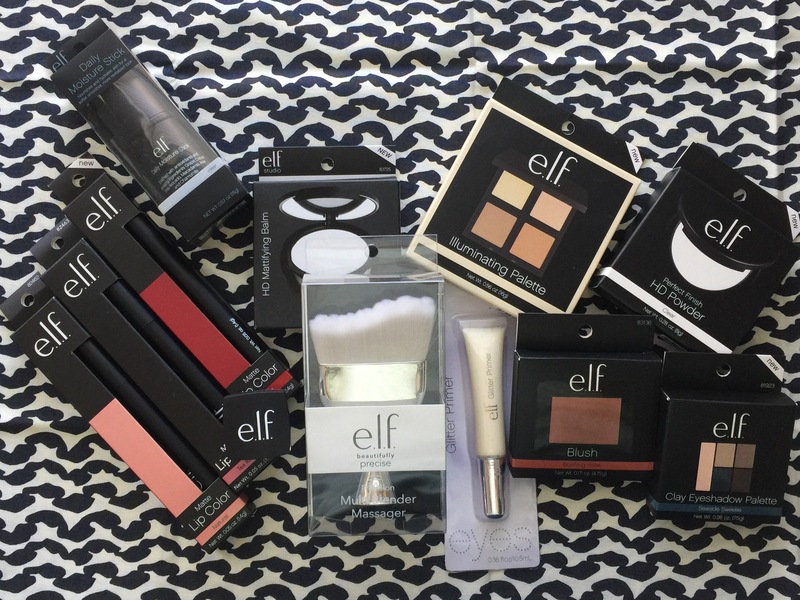 I love E.l.f.’s mystery grab bag-type gifts–I am always up for trying new things, and like subscription boxes, I love it when the items are chosen for me to push me out of my comfort zone a bit! Clay Eyeshadow Palette in Seaside Sweetie ($6): While I haven’t tested this out on my eyes yet, I am very impressed with the swatches. For $6, you get 5 highly pigmented shadows in a small compact with a mirror. There is even a clear sheet over the shadows that explains where to put each one if you’re a beginner. E.l.f. is really stepping up their eyeshadow game. And the cool tones in this palette are just stunning. Studio Blush in Blushing Rose ($3): Sometimes the E.l.f. Studio blushes are not as pigmented as their other lines, but this one appears to be very good. It is a deep dusty rose with gold flecks, a color I tend to love. I’ve been loving blushes that look like a sheer brick red; this seems like the rosy version of that. It actually reminds me a lot of the Balm’s blush in Hot Mama. Perfect Finish HD Powder ($6): This is a compact of pressed HD translucent powder. It has a mirror and a round sponge. I will admit, I don’t have high hopes. I don’t love E.l.f.’s loose translucent powder–it leaves a white cast on my skin, even when I’m at my palest. Other white translucent powders I’ve used–the NYX HD Studio Finish powder and Tarte Amazonian Clay powder–do not. So I am skeptical that this one will be truly translucent, but I will certainly give it a try! So that’s my haul! I love testing new products, so I’ll be updating you on how these products work in a series of four review posts. Be on the lookout for those if you’re interested in any of these products. And please let me know in the comments if you have tried any of these products, or if there are any other E.l.f. products I should look for in my next haul! I’m a HUGE fan of elf! They had a promo sale, free shipping with no minimum purchase required! I got an eyeshadow brush (their brushes are holy grail status! ), a pair of lashes bc they looked promising, and 3 eyeshadow cream pots. I’m so excited to try the new fall eye colors I got! Elf skincare line has great products! They’re better for everyday skin care like makeup removing and moisturizing more so than heavy duty, but they’re good! Let me know what you think of the cream pots! I only have one in a light inner corner highlight shade, but I’ve been using it a lot lately! Id love to know how other shades perform!